I'm also feeling strangely validated in this new obsession by the fact that, weirdly, some of the Big Fashion Mags are also all about the shirtwaist this spring. There were some really nice ones in Real Simple, and a page of them in Bazaar, too. The truth is, even if something is EVERYWHERE, you can make it your own just by being yourself. A stylish woman can wear head-to-toe H&M, accessorized by Gap, and look one-of-a-kind; an unstylish woman can wear couture and look as if she was extruded from some high-throughput plastic mold. But back to my obsession: what should I make first? A black bandana-print version, or that brown roses sateen that I bought way back? I bet you thought I was over the Duro, huh? The black! And send the brown roses to me. I like and vote for Black Bandan tto. I am goingto make a black skull and cross bones, and roses print fabrick Shirt waist dress — but I have to get a new machine. Mine broke and is unfixable. Well, I am all for using up the stash, but I like the black bandana print, too. I vote for black bandana! Crisp and perfect for winter-to-spring transition when everything in the closet seems wrong. I guess I’m pretty proprietary when it comes to my style. It bothers me when a look I’ve long worn and thought original dare I say signature shows up at Target. Phooey. I love what you say.The black bandana print. But again I must ask: Is a shirtwaist or shirtdress just a shirt with a skirt attached? Another vote for the black bandana! A contrarian vote for the brown roses.It feels sort of early springy to me. defying the options presented to me, I vote for using some of that rad south african fabric. I LOVE that you invoked Kant’s categorical imperative. And I’d never looked at fashion in that way, but you’re so right. I’m so glad I’m not the only one voting for brown roses – your description about the very prim, severe shirtwaist with the brown piping sounds both sweet and salty! Brown roses, brown roses, brown roses! Well, I was reading through the post rather quickly this morning while my husband was talking to me and I thought it said “black banana-print.” So I’m thinking “Wow, Erin sure does take her novelty print obsession to an extreme.” Imagine my disappointment when I clicked on the link.I vote Brown Roses!!! Brown roses! 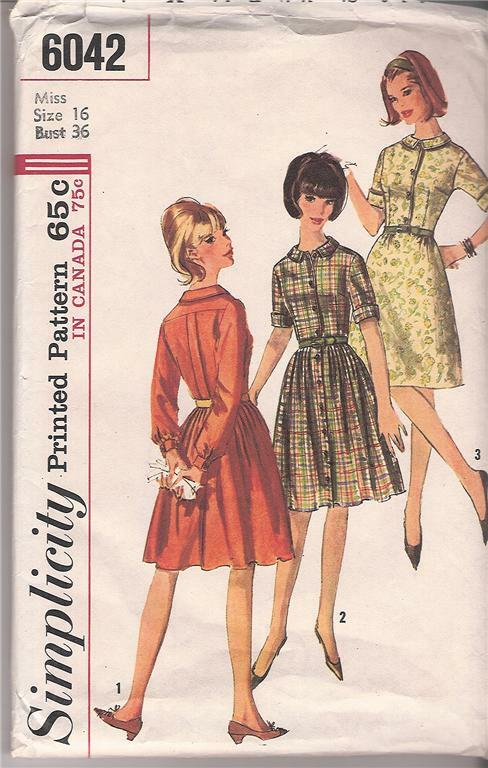 And I’ll join you in sewing a shirtwaist dress with the “mom” pattern I bought last week. Wonder who pointed it out?? Definitely the brown roses. And now you’ve got me searching for cute shirtwaist patterns myself! i vote for both… the black bandana first in the full skirt version and then the brown roses which i really love too, in the a-line version. i want them both to be made up… and they seem perfect for you! My concern is always that if something I like is in fashion then inevitably it will be out of fashion and I will look silly. I know that I need to get over that last part.I want to make a shirtwaist. I rock those things. They make the most of my shape and I love how practical they are. I had no idea that shirtwaists were in style again until I picked up a Vogue at the library and saw full skirted beauties. Smugly trudged home to sew up the Blue Flannel Shirt-dress I had already cut out for winter…why wait until spring? Dittos to Kate, they fit my shape, too and are so feminine and practical. Oracle, the shirtwaist is an improvement on a shirt with a skirt. You don’t have to keep it tucked in! Love shirtwaist. Hate having an extra three inches beyond standard measure waist LENGTH. I can be 8 months pregnant and no one notices, but the trade off is not being able to buy dresses off the rack.And that, people, is why sewing is a must. yay! I’m so glad I’m not the only one in love with the shirt-waist. They’re feminine and nice to wear, but still practical! They always make me feel 40ish, even if they possess no details remotely derivative of the 1940s. Brown roses fo’ shizzle.I’ve got some yellow gingham I should make into a similar pattern. It will make me feel so springy. I’m voting for the brown roses too. Oooh–the black bandana, hands down! at first, i thought the link said black BANANA. i was envisioning a black fabric with bananas on it, which made me very excited, so i was a little disappointed to realize it was BANDANA. therefore, i vote for the brown roses (it helps that i have a black and red version of that one). Oh, the brown roses. Love these simple and classic styles. Still stuck on Duro though. I would love to see the brown roses in a full skirted version. Gorgeous! I am insanely jealous of you for owning that fabric though, silly me, I would love it so much I would fear cutting into it. It is exactly the type of fabric I would hunt down and hoard, which my great-grandchildren would one day find stacked neatly next to my box of patterns, sadly still uncut. Thank you, Sarah. A definite improvement!My favourite shirtdress for years was HotPatterns Denim Diva Working Girl Shirtdress. It had a jean-jacket style, fully-yoked bodice; drop waist with western-style back yoked skirt, and really nifty jeans-type pockets at the hips that appeared to curve down and outward from the lines of the bodice, above.I put in for one from their end-of-year sale in December, 2006, but by the time they processed my order, they were all sold out and discontinued. I spent many months after that trying to find one on the web, without luck. I even got the perfect psychedelic, batiked denim fabric for them!Does anybody have this pattern, used or unused, and not want it anymore? In Slinky Girl (or even Glamour Girl) sizing? I love shirtwaists, but I only wish they weren’t so complicated. All that interfacing and all those buttonholes and that gosh-darn placket… a little overwhelming for a girl who has only been sewing for two-three years. But what can I say? It’s worth it. P.S.- Make it in the head-sized roses. Definitely. Brown roses, for sure. I was opting for the bandana print, until I imagined the rose with dark gray or brown piping and matching gray or brown self-cover buttons. Lovely!The only thing that annoys me about shirtwaists is their tendency to gape, even when they fit perfectly – does anyone know of a way to avoid this? Oh, come on; you KNOW you want to do both! So I say do both. They’re both going to be great but I am DROOLING over the black bandanna print! I don’t even sew enough to justify the purchase but my fingers are itching to get hold of it. May have to order some!On the other hand, I bet it’d look adorably Marian the Librarian-ish: the brown roses with a short sleeved cardigan and court shoes. Sigh, too many choices! Are you going to add side-seam pockets? Shirtwaists are classic, especially in spring/summer. At least I think so. Though my awareness of trends may be slightly skewed by my desire for my retro dresses.Anyways, the spring short shorts aren’t as bad as the WINTER short shorts. Yes. Shorts. IN WINTER. Every store I’ve been to has them right now. If I wore shorts in the winter, they’d be bloomers. Under a skirt. They’re both great. I hope to see photos of each one as you finish. Libby – I like that! I have similar pattern, but with a smaller collar. Thanks,I’m thinking we should have a *ShirtwaistFest*…(say that 6 times fast)… Everybody make a vintage shirtwaist and Erin can pick a day we show the world! Brown Roses! This is a spirited poll! I am *loving* shirt dresses and was looking for a pattern just the other day.